Royal representatives from around the world gathered in Bangkok yesterday to pay respects to Thailand’s King Bhumibol Adulyadej on the first day of his official, three day funeral ceremony. The king, who is now known as King Rama IX, died October 13, 2016 and was, at the time, the world’s longest serving monarch. 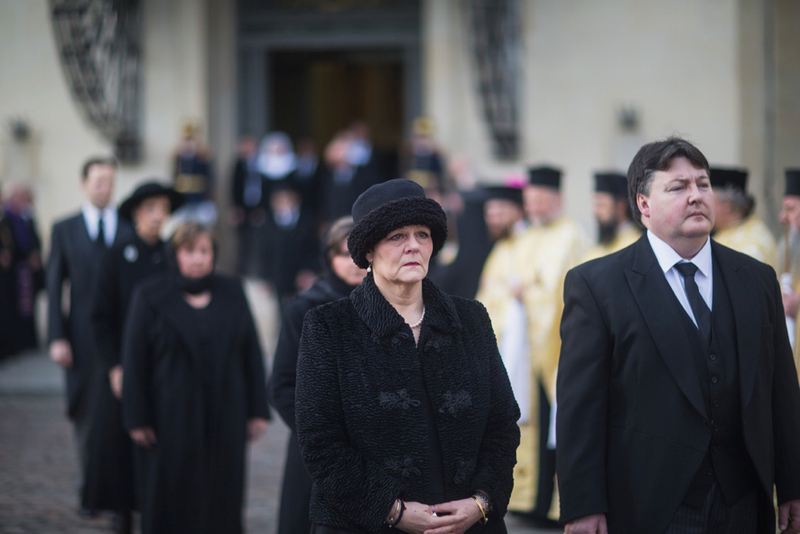 Among the many royal mourners at yesterday’s cremation ceremony, three wore headpieces. Queen Máxima repeated her black open crowned headpiece (see a better view of this piece from its last outing over at this post) while Queen Mathilde wore a black calot hat with textured side trim. This piece doesn’t match with other black calots in Mathilde’s wardrobe so I can only assume it is new. Princess Margaretha of Liechtenstein wore a black fascinator, presumably of flowers or feathers, tucked into the right side of her hair. 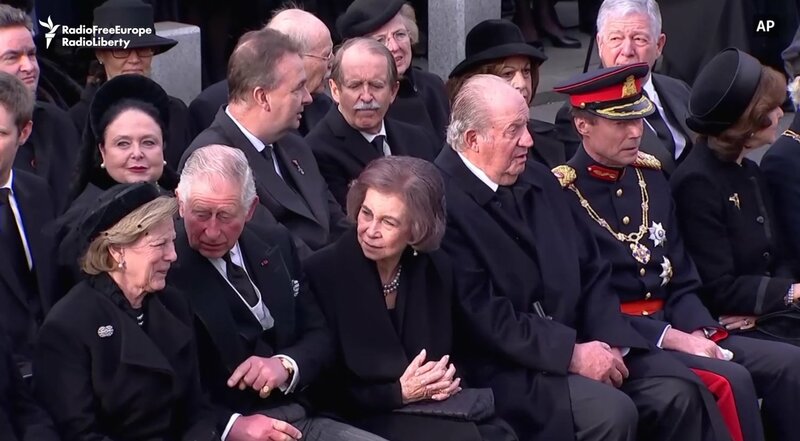 Prince Nikolaus and Princess Margaretha of Liechtenstein (who is a first cousin to King Philippe) also attended the service this year. Princess Margaretha repeated a simple black brimless bumper hat. During past outings, this hat has appeared to be a pillbox but if you look closely at this photo, you’ll see a rounded crown surrounded by a bumper brim. Princes Marie Esmeralda and Princess Léa (standing beside King Philippe, below) also attended although neither wore hats. While Princess Astrid, Prince Lorenz, Prince Laurent and Princess Claire often attend this event, they did not this year. This made for a less dynamic group of Belgian royal hats than we usually see at the Te Deum, leaving just two for us to admire this year. Members of the Belgian Royal Ramily attend the annual celebration of the Eucharist in memory of the family`s deceased members at Our Lady Church in Laken today. Queen Mathilde used this occasion to début a new cloche hat. With a grey felt crown and beige felt brim, this hat was trimmed with a simple double band in beige fabric, wrapped around the bottom of the crown. We have not seen Mathilde in many cloche hats and while it is not my favourite millinery style on her, this particular hat brings and air of innocence and beauty that works well for her. Don`t you think Queen Mathilde looks incredibly young in this hat!? While Queen Paola did not wear a hat, Princess Astrid and Princess Claire also wore new pieces of millinery. 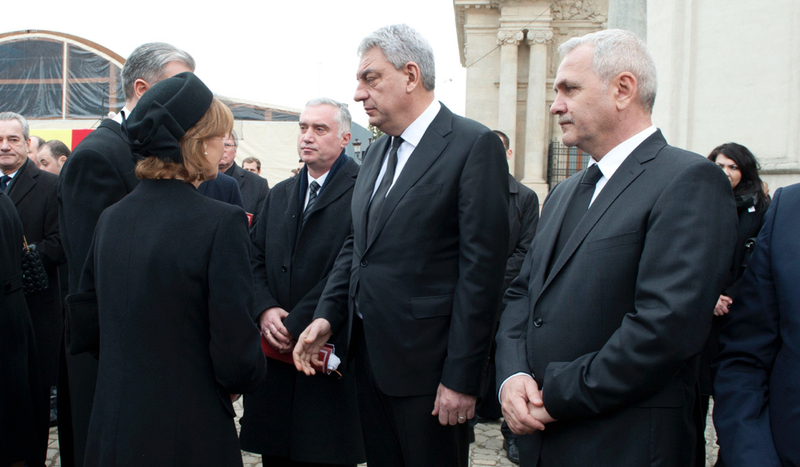 Princess Astrid’s black felt hat featured a flat crown and wide, cartwheel brim. The brim was trimmed in the same black silk ribbon that was wrapped around the crown and while this embellishment was simple, I thought it was wonderfully effective and emphasized the graphic lines of the hat. Princess Claire wore a navy fedora with oversize brim. Trimmed with a triple band around the crown that twirled into bow loops on the side, this hat was an excellent colour and scale for Claire. We have seen Princess Claire successfully wear several fedoras in the past and this hat further solidifies this style as one very well suited to her. In a photo released later yesterday, we could see that Princess Marie-Esméralda wore a black feathered fascinator (below, right). Princess Margaretha and Prince Nikolaus of Liechtenstein were also in attendance; Princess Margaretha wore a simple black pillbox hat. It is not often that we see the simultaneous début of three new Belgian royal hats so today is special indeed! What did you think of this trio of new millinery? Here are a look back at all of the hats and headpieces worn by members of the royal houses of Liechtenstein and Luxembourg this year. Please click on each photo to link to larger views and detailed information on each hat. Do any of these hats make your list of favourite royal hats of 2014? Are any of them among your least favourites?